Thirty-three years ago today, I was immersed to the water of baptism in 3.5 feet water tub of MC lumber yard at 3 in the afternoon. Elder Arturo A. Tolentino baptized me and Elder Daniel Crosley bestowed upon me the gift of the Holy Ghost and confirmed me member of The Church of Jesus Christ of Latter-day Saints. Before I came down to the water of baptism, a missionary, a zone leader interviewed me the basic truths and principles and ordinances of the gospel which the full-time missionaries had taught for almost three weeks. My conversion was no ordinary one for it started sometime in 1976 and it took me 4 years to be baptized and accounted as a confirmed member of the Mormon Church. I waited such long years after the Samoans missionaries who taught me the basic discussion of the gospel, unintentionally destroyed the extension part of our makeshift nipa hut for his heavy weight. I waited for the day they promised to return for a follow up gospel discussion, but unfortunately they didn't come back. 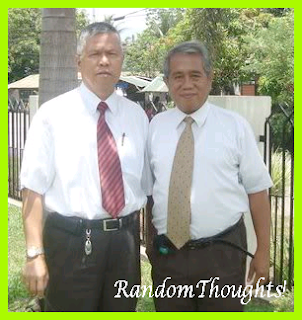 In 1980, another pair of full-time missionaries, Elder Crossley, an America missionary with his junior companion, Elder Tolentino happened to pass by my parent's house which where we transferred after that destruction of our nipa hut. At last the required lessons were completed and I was scheduled to be baptize. A day before my baptism, Elder Crossley was transferred and Elder Wagner took his place. Elder Tolentino and the new Elder paid a visit in our house to verify my baptism. Elder Tolentino asked me who is going to baptize me and also to confirm. I preferred a Filipino to baptize me, so I chose Elder Tolentino and Elder Wagner to confirm me as member of the Church. And during that time Brother Joaquin Villarias was my fellow-shipper. Since then, I was active in the Church. Brother Villarias and I were always together in going to the Church. We're even tagged as the inseparable duo. I received various Church callings after I was conferred the Aaronic Priesthood and ordained to the office of the Priest, and after a year I was conferred to the higher priesthood like the Melchizedek Priesthood and ordained to the office of an Elder and finally to the office of the High Priest as I was set apart as the first counselor of the Bishopric of La Carlota first ward to the late Bishop Joaquin Villarias whom I had a testimony that he was really the anointed one of God. My membership was strengthened and even edified when I baptized my own family and even my wife. My wife later became member of the Church two months later after my baptism. She was convinced of my faithful conversion to the Church for I had forsaken all of my personal vices and became a straight-forward head of the family. By my example, she decided perfectly, without any reservation to accept the challenge to be a member of the LDS Church and I baptized and confirmed her as member of the Church. In 1986, my family and I were sealed for time and eternity in the Temple of God in Manila. And we were able to perform temple ordinances later in November 2012 at Cebu Philippines Temple. I am not ashamed to share my testimony about the truthfulness of the Church, the fulness of the gospel of Jesus Christ and the restoration of the Church of Jesus Christ from primitive time to the present dispensation. The greatest spiritual achievement I may consider as a member of The Church of Jesus Christ of Latter-day Saints are as follows when the whole members of my family went to the Temple, received our spiritual endowment, sealed together as a family for time and eternity; and saw together with my wife the living prophet of the Church, President Thomas S. Monson, in person who went to the cultural presentation of the youth in Cebu Coliseum on June 12, 2010. 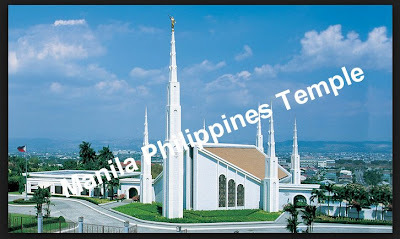 And on the following day of June 13, President Monson dedicated the Cebu Philippines Temple. The testimony I nurture and keep it in my heart that the Church is true, that Jesus Christ is the son of the living God, and that Joseph Smith is instrumental in restoring the Church of Jesus Christ and the spiritual truth about the priesthood authority and the Book of Mormon as another testament of Jesus Christ. It is my freewill or nobody has forced me to join with this Church. I know that through the living prophet - God will still reveal more truths to save all mankind. No one will be compelled to believe on this except his unwavering faith. Therefore it is my testimony that this Church of Jesus Christ of Latter-day is the true Church in the face of the earth and the Book of Mormon contains the words of God and we have the living prophet by the name of President Thomas S. Monson who receives revelations from God to guide us in these latter days... in the name of Jesus Christ. Amen.